As a Syrian refugee in Lebanon, Nour knows life can be tough. So the 15-year-old leaped at the chance to train as a hairdresser with L’Oreal, hoping one day to open her own salon in whichever country she ends up. “Sometimes life can knock you down, so you need to be able to stand on your own feet,” she said, keeping water out of the eyes of a training mannequin having its hair washed in a classroom in Lebanon’s Bekaa. 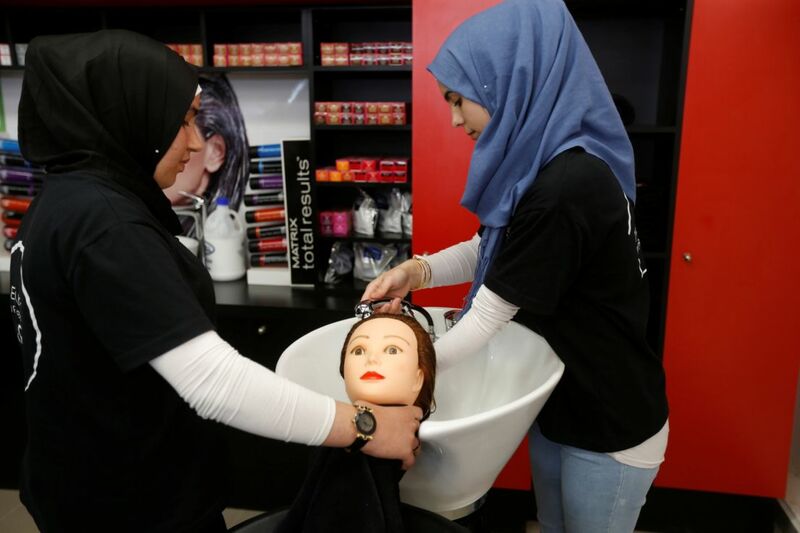 Around 20 Syrian and Lebanese girls and women will study hairdressing for six months under the L’Oreal Foundation’s Beauty for a Better Life program, earning an internationally recognized certificate if they are successful. “The certificate will support us. We don’t know what could happen to us, especially me. Maybe I won’t be able to continue my education,” said Nour, who grew up in the Syrian city of Idlib before war forced her out. She declined to give her full name for safety reasons. Syria’s war has killed an estimated half a million people, driven some 5.6 million people out of the country and displaced around 6.6 million within it. Many Syrians moved to the Lebanese town of Bar Elias where the training salon is located, just 10 kilometers (6 miles) from the Syrian border, doubling its population and putting pressure on services and squeezing job opportunities. The United Nations classifies Bar Elias as one of the areas in Lebanon with the most vulnerable refugee and host communities and aid has been directed there to help Syrians and Lebanese. The salon sits within an all-girls school built by the Kayany Foundation, a Lebanese educational charity. “The [L’Oreal] academy gives them the chance to be able to take their lives back in their hands and build a better future anywhere in the world, especially if one day they manage to return to Syria,” Nora Jumblatt, the director of the Kayany Foundation, told Reuters. As the Syrian army, backed by Iran and Russia, has recovered more territory, some Lebanese officials have stepped up calls for refugees to return to parts of Syria where violence died down. However, UN officials and foreign donor states to Lebanon have said conditions for returns are not yet right, and many refugees say they are too scared to go home. But it is difficult for Syrians to find legal, secure work in Lebanon, with many scraping by on aid and low-paid jobs in sectors such as agriculture and construction. Manal, 30, who lost her husband to Syria’s war and fled to Lebanon with her children, is determined to get her certificate from the beauty academy and do the best for her family. “I’m not educated and that’s the biggest blow for me. ... I can’t work as anything,” she said, using a false name to protect her identity.